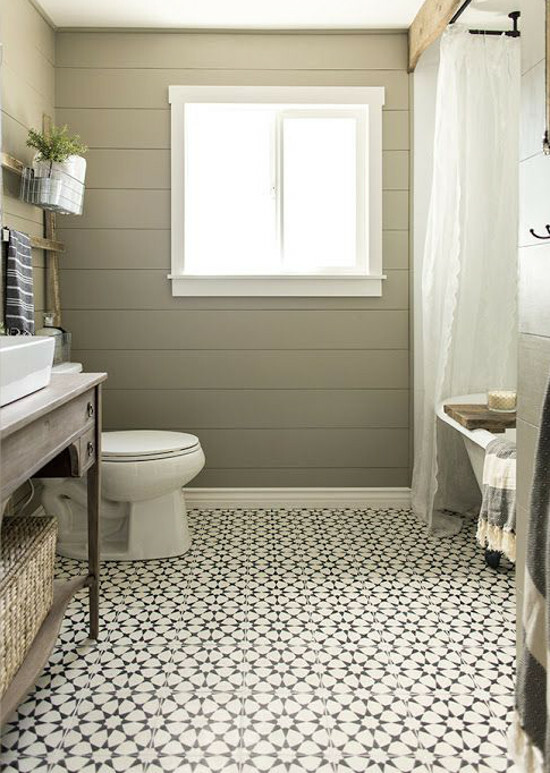 Like lively carpets, bathroom floor tile patterns have personality as well as color. Two of the sharpest bathrooms I’ve seen lately have moved away from the peaceful spa like look that has dominated bathrooms for the past few years. 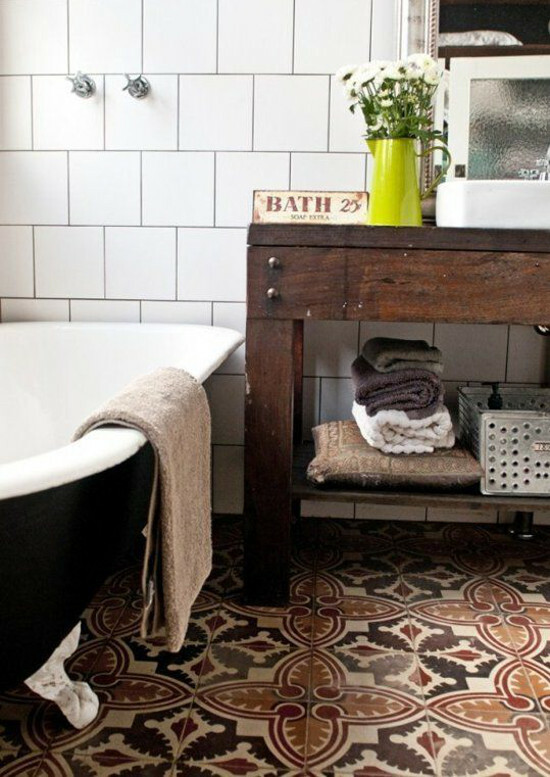 The appearance of large scale patterned bathroom floor tile — encaustic cement tile — is an old look finding a new audience as encaustic tile sources become more numerous and the tiles are affordable. It’s a refreshing change — one I noted in my post on Bold Bathroom Tile Pattern — and in several posts on kitchen floors dating back to 2012. In a way, patterned bathroom floor tile is the opposite of neutral stone mosaic. It makes a statement both with color and repeated pattern but since the pattern is not at eye level even the most intense choices are somewhat tempered. One good example is a bath done over by Etica Design, in Australia, using recycled and second-hand materials. 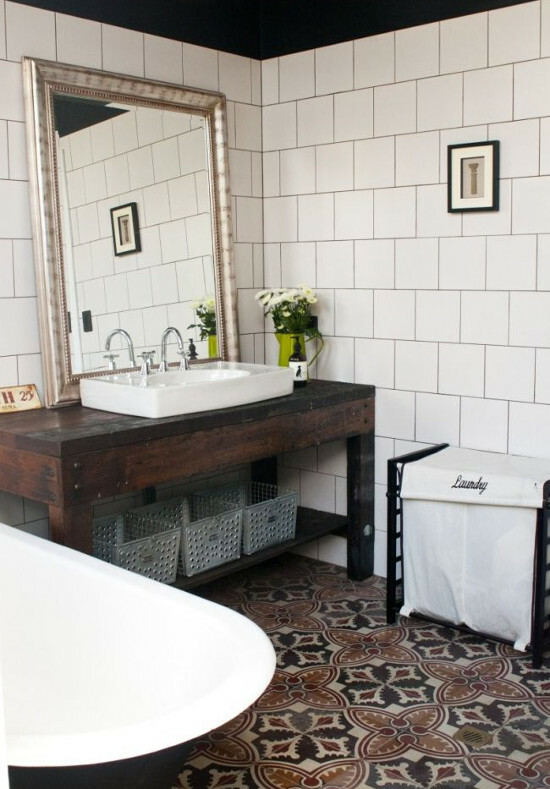 The cloud gray large square field tiles used on the walls were found in a salvage yard, the clawfoot tub was old and the bathroom vanity is a repurposed work bench made of jarrah, an Australian hardwood. Although the tile is antique, with a very traditional pattern, it was a new element for the bath imported to Australian from Spain. The earth colors pick up the walls, wood tones and black exterior of the old clawfoot and the print seems surprisingly tame in the relatively small space. Encaustic tiles date back to the 19th century. The patterns are produced by adding colors to a mold so, unlike ceramic tiles, the color runs through and through. It’s not just on the surface of the tile under the glaze. Encaustic tiles require sealing before and after grouting and then periodically. Somewhat porous, they are durable and require the same cleaning and maintenance as natural stone. A more modern, geometric pattern was used in a redone guest bath. With taupe walls and antiqued wood the bath is enlivened by the black and white geometric stars — a pattern called Agadir, after the Moroccan city, from the Cement Tile Shop. Because the proportion of white is higher than the black, the floor has a lightweight appearance and simply looks contemporary rather than exotic. 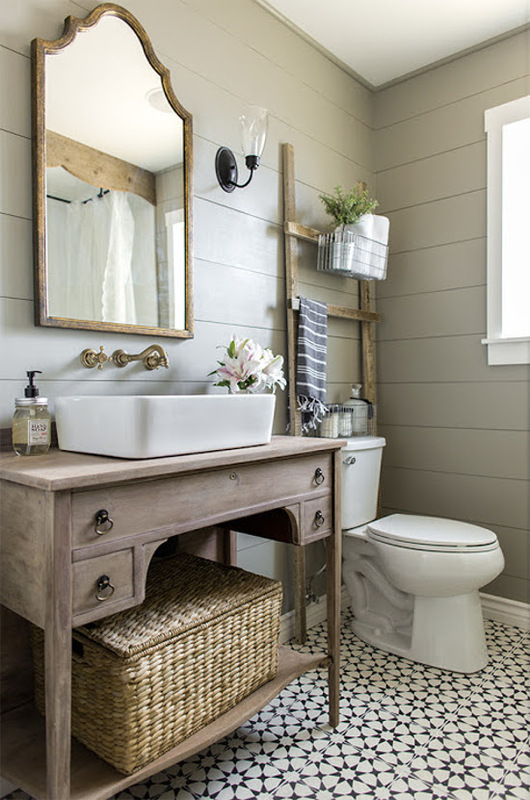 The mix of styles — from the repurposed vintage sideboard vanity, to the cottage-y salvage wood ladder, to a modern vessel sink — is fully supported by the abstract tile pattern for this tone-on-tone bathroom symphony from Jenna Sue Design. For more cement tile floors see Cement Tile Kitchen,Cement Tile Yellow Kitchen and Vintage Tile Kitchen Floors. I love the encaustic floors, and in my dream bathroom it would be all over. Im afraid of getting dizzy by the pattern though. I cant remember the last old building I was in when there was a busy floor. Also you’re supposed to seal them once a year I think. I think it would be worth it though. I think it depends on the pattern. The zig zags are tough for me. Others seem just fine. I was especially intrigued by these floors as I’m researching tile for my bathroom project and a soft color encaustic tile would look great. But, the require the same maintenance as marble or other natural stone. I spoke to one manufacturer who said seal times before they go down and again after grouting. Then twice a year. Evidently they can be stained by water so not the best to use in a shower. I haven’t ruled them out but they don’t compare to porcelain tile for durability or ease. Everything is a trade off. Just ran across this post and I’ve been enthralled with encaustic tile since visiting, of all places, a restaurant restroom in Milwaukee, WI, that incorporated them. I was instantly smitten… they are lovely. Thanks for posting about them! I just love the encaustic patterns. I’m trying to think how one would look at my house, which is cottagey. Meanwhile, here’s the photo of the floor you so kindly posted on houzz. Think it can show up here. Where online can I find that black/white star pattern in the pic above? Thanks! The pattern is called Agadir and it’s from the Cement Tile Shop, as I mentioned in my post. referring to the picture with the agadir floor and re-purposed vintage sideboard. thank you. However, as a shortcut the wall color is Valspar Gray Silt, satin finish and the vessel sink is from Wayfair. I LOVE this post. Where can I find the spanish tile in the 1st 2 pictures? I looked at the Cement Tile Shop site and didnt find anything like it. We are remodeling our spanish style home bathroom and Id love to do this. did you have any luck finding these/similar spanish floor tiles? I read in a different post that these are antique/second hand. I am desperately searching for the Spanish floor tiles shown in the first picture above as well. Has anyone been able to locate them or a porcelain tile with that same pattern?